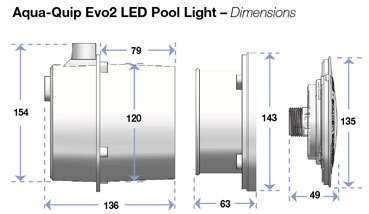 Introducing the Evo2 pool lighting system, the latest advancement in pool lighting technology. 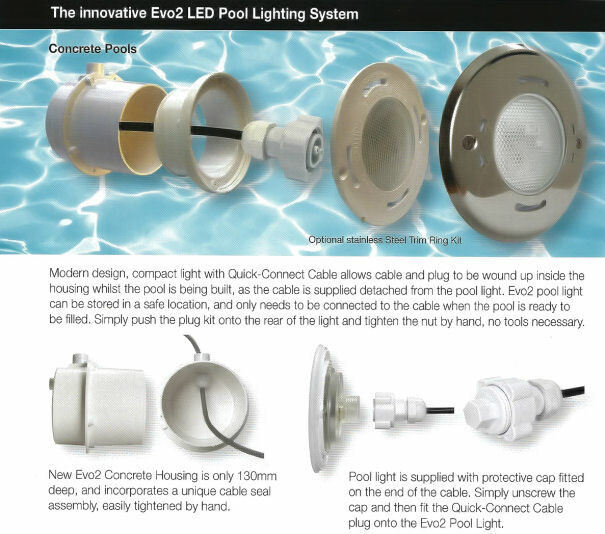 The Evo2 pool lighting system combines many unique features resulting in a spectacular, ultra reliable lighting system that is user friendly and easy to install. These LED lights are available in fixed colour white, blue, green & multi-colour with multiple colour changing programs. The beauty of the Evo2 is that the lights sit flush with the pool wall making them totally unobtrusive. The lights are stylish and modern, making them ideal for all types of water features, spas, fountains, waterfalls, beach areas, ponds and catch tanks. The elegance of the lighting systems can be enhanced with the addition of the optional stainless steel trim ring, creating some spectacular visual effects. The Evo2 system is supplied with the latest generation LED technology and industrial strength transformer to ensure maximum light output. In addition, Evo2 lights are energy efficient and have a rated life of up to 50,000 hours. the entire system is extra low voltage to ensure safety at all times. Kits include LED EVO2 Niche lights, 20m cable for each light & transformer plus wall buckets & construction plugs.